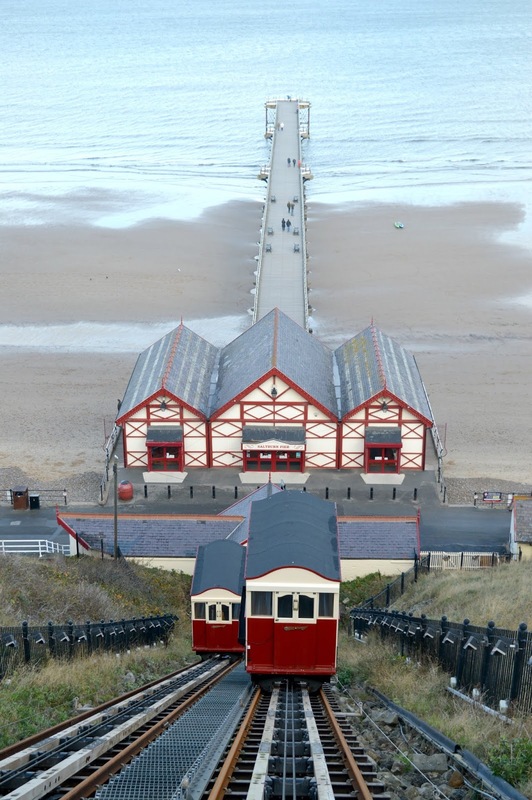 Saltburn is a part of the North East coast that I've been very curious about for a while. A fair drive from our home, I've never been sure if it was worthy of a day trip and every time I asked people about it I was given mixed reviews. Not wanting to risk driving a long way for disappointment, it's been filed in the back of my mind as a "maybe one day" for a good few years now, until we found ourselves in the area and thought it was about time we gave it a look. 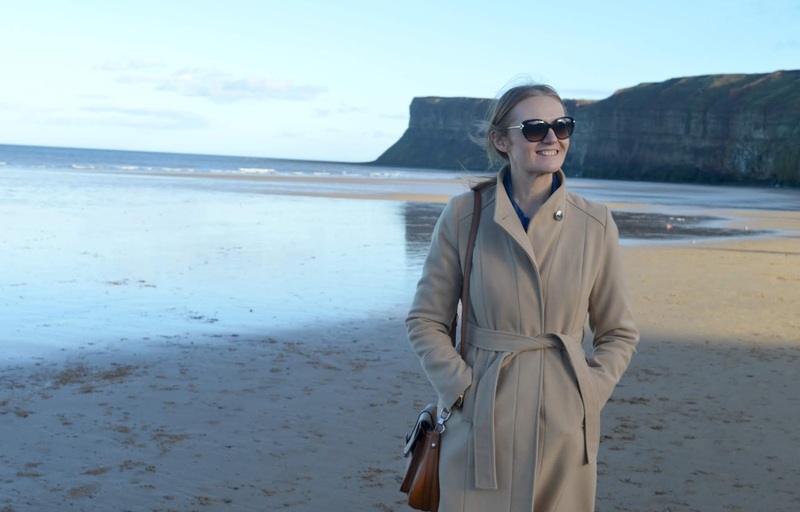 Saltburn is a little seaside town in North Yorkshire just a few miles from Middlesbrough on the North East coast and is filled with Victorian charm, smuggler legends and, I was hoping, the chance to finally try a Lemon Top! Arriving in Saltburn on a sunny Tuesday morning reminded me how beautiful it is to visit the coast on a week day in the Winter, parking was a breeze and, although there were a few people pottering about, the tourists were long gone, leaving just the dog walkers and locals behind. Bliss! The ice-cream shops may have long been boarded up for the Winter season and the beach huts sitting side by side in silence yet there was still a real charm to the seafront. The Pier isn't the only special thing about Saltburn, the famous "cliff lift" has been attracting tourists for years. Unfortunately it was closed during our visit but with the carriages left stationary up the tracks you still get a great view of the lift and it really is a spectacular sight. On a clear day the view down the tracks and out to sea is pretty special and I think it has to be one of the best views in the North East. With no cliff lift in operation there was nothing for it but to walk up the cliff towards the town. 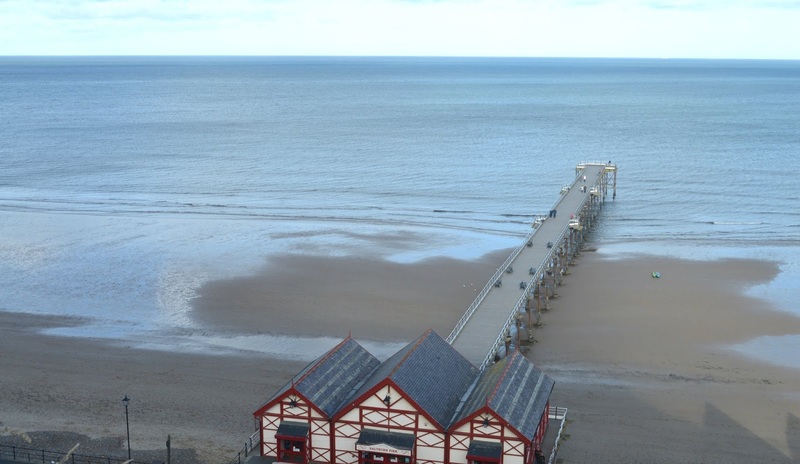 The centre of Saltburn is a short uphill stroll from the seafront and the workout is definitely worth it for the lovely little collection of independent bars and eateries you'll find at the top. 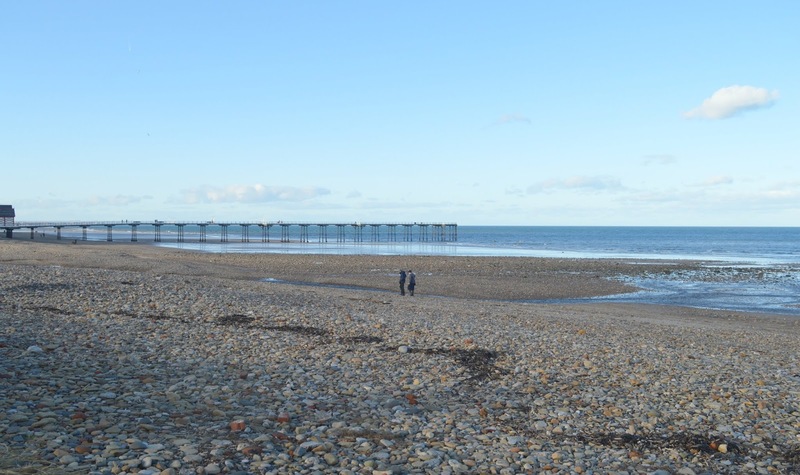 Although small, Saltburn is great for a stroll and I made a mental note of a fair few places I'd like to try on our next visit. This time we were on the hunt for an indulgent hot drink to warm us up and The Sitting Room was the perfect spot. 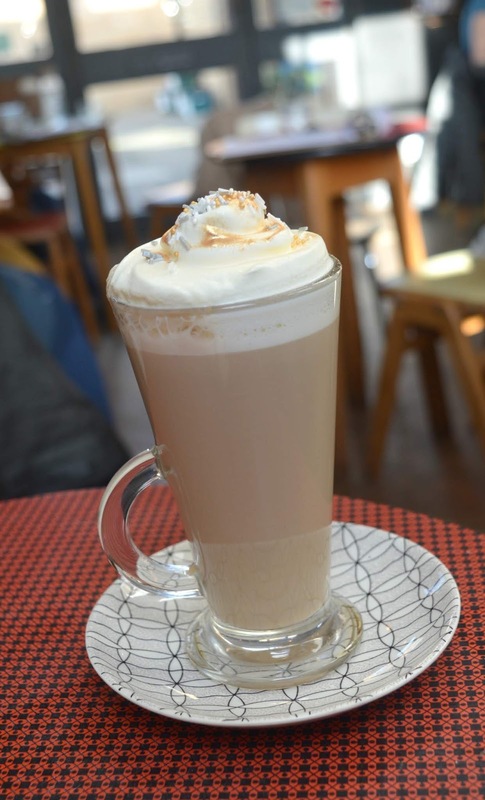 Cute and quirky with the loveliest vibe, their seasonal lattes and hot chocolates were just what we were after and I couldn't resist ordering a Luxury Spiced Pumpkin Latte (£5.00) - Baileys with Pumpkin Spice, Espresso, Steamed Milk and a mountain of Cream. Throwing booze into coffee is my kind of treat and it really warmed me all the way down to my toes - delicious! Deciding we wanted different scenery on our walk back down to the beach we decided to make our way back down the hill via theValley Gardens, a beautiful spot for a Winter's walk. With a little mini train for the kids, a huge tea room and stunning Italian gardens it was so beautiful and peaceful in the Winter but we definitely want to return in the Summer months to see it in all its glory. All that walking really builds up an appetite and with the smell of fish and chips in the air we decided that we needed a proper seaside lunch. 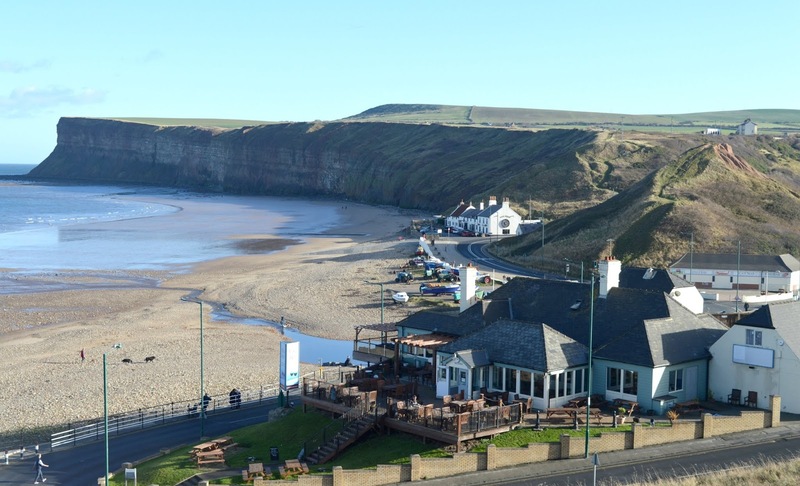 There are a couple of beautiful looking seafront restaurants in Saltburn which offer windows overlooking the sea and we decided to go with Vista Mar, which had a nice variety on the menu as well as great views. 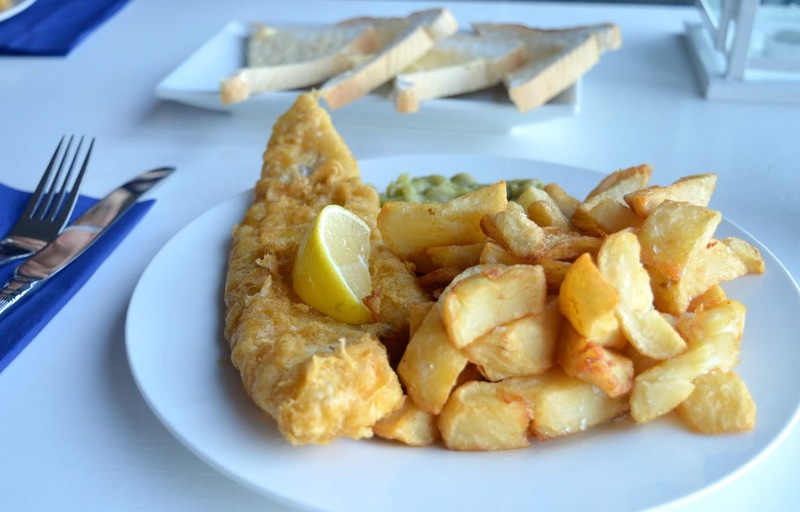 The joy of visiting the seaside mid week is being able to take advantage of the fish and chip deals and we managed to get ourselves a huge fish and chips with mushy peas and a side helping of bread and butter each for £25.00 including two drinks. Although we were really hungry when we had arrived after a few minutes of greedily wolfing this lot down it wasn't long before we were feeling very podged and couldn't physically fit in another bite. When you are that full on delicious seaside grub there's only one thing to do - go for a nice brisk walk along the beach. With the last of the Winter sunshine still beating down on the sand we thought it'd be such a shame to cut our day short so ended our day with the nicest little mooch. The coastline from Whitby to Saltburn is famed for its smuggler folklore. Remote coastal communities were ideal for smugglers as it was easy for contraband to pass from house to house with no risk of detection. Saltburn was a haven for smugglers with its huge cliffs and coves. 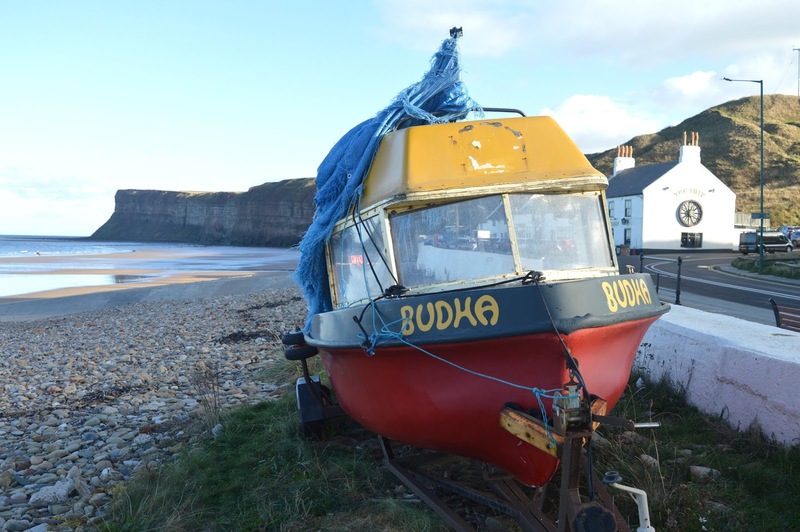 Perhaps the most famous smuggling legends centre around The Ship Inn, which you can still find today along the beach. 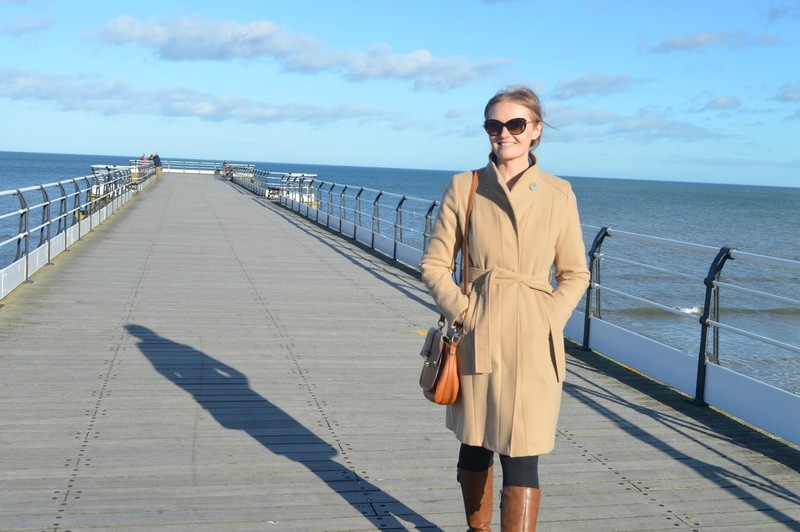 I loved walking along a seafront with so much character and history, the perfect place to let your mind wander. Unfortunately we didn't get a chance to visit The Ship Inn on this occasion but as we also didn't manage to find a Lemon Top so that just gives us a perfect excuse to return in the Summer and, believe me, Saltburn has left us wanting more! If our little day trip proves anything it's that sometimes when people tell you not to bother visiting somewhere, sometimes they really don't know what they're talking about. Saltburn is the loveliest place to spend the day and we are over the moon to find somewhere else so special in the North East. Yes most definitely! One for the Spring time I say! You were lucky having the chance to go during the week, it gets so busy during the weekend (even worse in summer) and finding a car parking space can be a nightmare. Saying that, the valley gardens look amazing in summer & you'll definitely be able to get your lemon top! :-) I haven't been to Saltburn for a VERY long time, it's only a 10 minute drive from my parents house so we used to go quite a lot - I definitely miss living so close to the beach. I think we'll get up very very very early one morning in the Summer and head down there - I really do want a lemon top! How have I never heard of Saltburn? It's absolutely stunning! Such a great post! Ahhh thank you, I do feel that it's a bit of a hidden gem! Looking forward to visiting in the summer - where did yous park? Top or bottom of the cliff? The bottom, there were so many spaces going on a week day in the Winter, definitely recommend! I absolutely love the beach huts. It looks so pretty there! 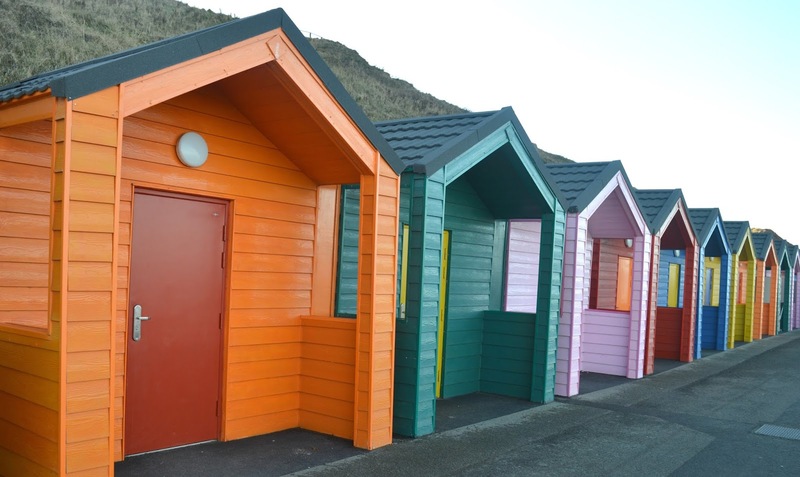 I do love a colourful beach hut! That Spiced Pumpkin Latte looks amazing! I initially thought wow £5.00 is a little steep for a latte but then I read it has Baileys so it's not bad at all! You always find the loveliest spots! Yes a good ol shot of Baileys there to make it a bit extra ;) Thank you, it's probably my only true talent in life! LOL! Now I want fish and chips! Those coloured huts are so pretty. OMG me too! And I only had some last weekend! I'm impressed you won a toy in one of those machines, I'm too much of a sceptic for them but the kids always love to have a couple of goes! Every now and again you'll find an amazing one that actually gives you a toy! It doesn't happen often though!